The Apostle Paul states his goal here in verse 2, that he intends to present the Believers to Messiah, as a chaste virgin. The fact that the espoused Bride-Candidate is a virgin does not say any more about her. From the word 'virgin' we do not know whether she is wise, or foolish; chaste or unchaste; Bride or Bridesmaid. All we know from the word 'virgin' in the spiritual sense, is that she has been Born-Again by being cleansed by the Blood of the Lamb — and has thus identified herself with Yahuweh's people. But what is a chaste virgin, in this passage? Let's look further. The word translated 'chaste' is the Greek word 'hagnos,' Strong's number <53>. As we look at this word, several things come into view. First, we see immediately the Strong's number 53 associated with this word. From Prophetic Numbers In Scripture we recall the prophetic meaning of the number '53' in Scripture speaks of entering in. We can surmise from this that those who retain their 'hagnos' status until the end, will indeed enter in. Next, we see the word 'hagnos' <53> comes from the same root word as the word 'hagios' <40> which means holy, or "set-apart for a special purpose." This set-apart quality is one feature of the virgin that qualifies her as a Bride-Candidate. 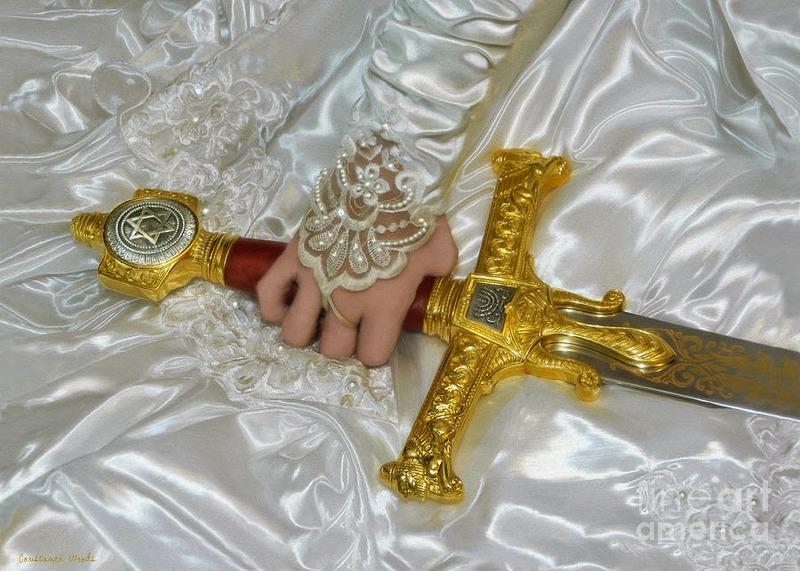 She has set herself apart from the world, for the sole purpose of being prepared for her Bridegroom. This reminds us of the Bride's commitment of herself to the Bridegroom, which she made early-on in her walk, in accordance with Rom 12:1-2. Next, we notice in the Strong's Concordance Greek lexicon, that one of the definitions of 'hagnos' <53> is "pure from carnality; Clean." Thus we see from this definition alone that the presence of a carnal condition can remove the 'hagnos' or chaste condition from a Bride-candidate. We will thus include carnal among the kinds of corruption that can disqualify one from being among the Bride-Company. The world seems to have lost having the "Fear of the Lord" but we must always remember "GOD IS HOLY" and it is only by His grace, mercy and forgiveness that we can boldly approach the Throne of Grace. Strive everyday to hallow God's name by living a life that is pleasing to Him! 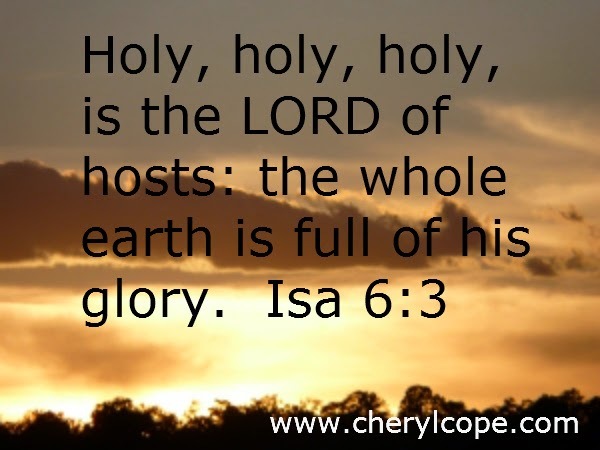 Holy, holy, holy: To say the word holy twice in Hebrew is to describe someone as “most holy.” To say the word holy three times intensifies the idea to the highest level. In other words, the holiness of God is indescribable in human language. To be holy means to be different, distant, or transcendent. Thus the song of the seraphim is a constant refrain that the transcendence of God is indescribable. Although the Lord is totally different from us—He is perfect—in His mercy He still reaches down to take care of us. The whole earth is full of His glory: The Hebrew word order is, “The fullness of all the earth is His glory.” We know that the glory of God transcends the universe (Ps. 113:4–6); yet in order to balance the expression of the transcendence of God in the first half of this verse, the words of the second half emphasize God’s closeness to His creation—His involvement with the earth and its people. The NKJV Study Bible. (2007). (Is 6:3). Nashville, TN: Thomas Nelson. The heart is what you are, in the secrecy of your thought and feeling, when nobody knows but God. And what you are at the invisible root matters as much to God as what you are at the visible branch. "Man looks on the outward appearance, but the Lord looks on the heart" (1 Samuel 16:7). From the heart are all the issues of life. Either make the tree good, and its fruit good; or make the tree bad, and its fruit bad; for the tree is known by its fruit . . . For out of the abundance of the heart the mouth speaks. (Matthew 12:33–34). So the heart is utterly crucial to Jesus. What we are in the deep, private recesses of our lives is what he cares about most. Jesus did not come into the world simply because we have some bad habits that need to be broken. He came into the world because we have such dirty hearts that need to be purified. So what is it to have a pure heart? You can see what David means by a "pure heart" in the phrases that follow it. A pure heart is a heart that has nothing to do with falsehood. It is painstakingly truthful and free from deceitfulness. Deceit is what you do when you will two things, not one thing. You will to do one thing and you will that people think you are doing another. You will to feel one thing and you will that people think you are feeling another. That is impurity of heart. 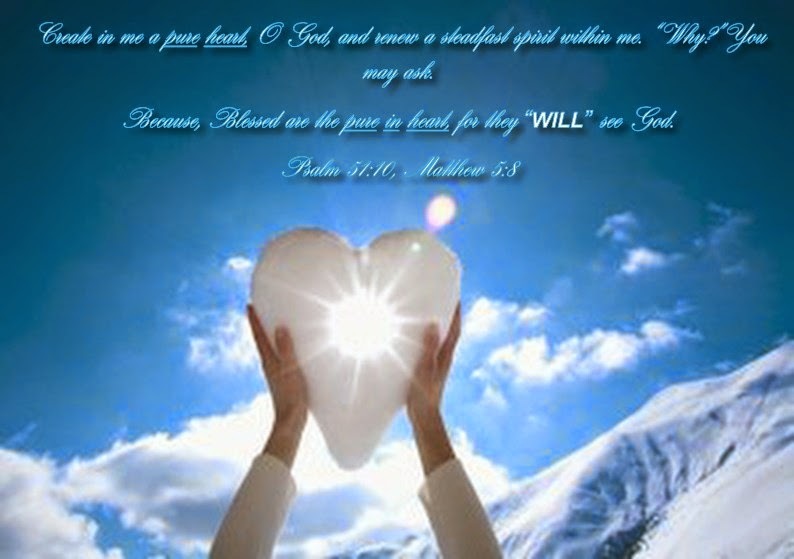 Purity of heart is to will one thing, namely, to "seek the face of the Lord"
What is it to see God? First, to see God means to be admitted to his presence. Second, seeing God means being awestruck by his glory—by a direct experience of his holiness. Finally, seeing God means being comforted by his grace. So when Jesus promises the reward of "seeing God" there are at least these three things implied: we will be admitted to his presence, not just kept in the waiting room. We will be awestruck with a direct experience of his glory. And we will be helped and comforted by his grace. And this we will have—in part now, and fully in the age to come—if we are pure in heart. As the Lord examines your heart and my heart today, He will be pleased if He sees faith in Christ and motives that want to do His will. If there is an area of our heart where that holy reality is not freely flowing, God can fix it. He can heal it. He can overwhelm our sin and our issues. But we must come to Him in repentance and humility just like King David eventually did. Without the sincere motive to be walking on the Lord's straight path, we will experience much unrest and a continual longing for things which are outside of God's will. It's the same for all of us. We all have a sinful nature. We all get to choose our motives. And we all experience the fruit of our motives. This is why all God has to do to see what someone is really about is to look at the heart. 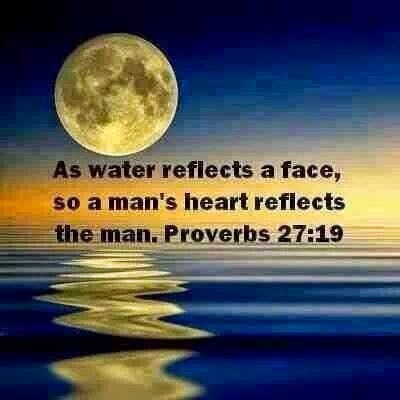 "As water reflects a face, so a man's heart reflects the man." (Proverbs 27:19) Actions reveal a believer's spiritual maturity, or lack of it, but the heart reveals our deepest intentions. And the strength of those holy desires and the depth of our love for the Lord tells God a whole lot about us. So if you find your heart today filled with unholy desires rather than righteous ones, you can ask God to do something about it. Who else is capable of performing surgery on the soul? Who but the Holy Spirit can give us a genuine love for Christ and an ongoing desire to do His will in all things? Bottom line: our Creator knows us better than we know ourselves. And He sees those issues within us that no one else comes close to seeing. Yet He still loves us even with all of our conflicted desires and imperfect follow-through. Now that's impressive, because that is true love straight from the heart of God! 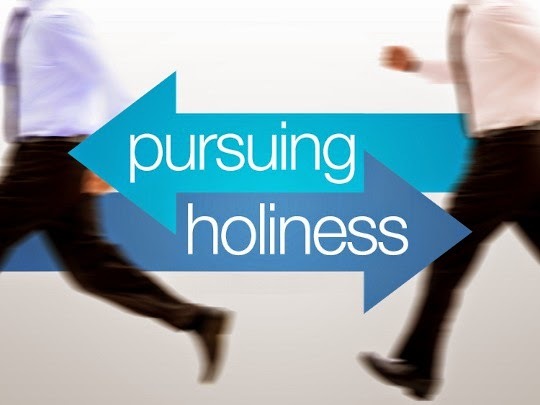 Pursuing Holiness! Go after it with everything within you! You must also understand that while you are JUSTIFIED before God by the death and resurrection of His Son, you are in the process of SANCTIFICATION as His child, as you seek to become holy. God, with your cooperation and obedience, perfects the work of making you holy. 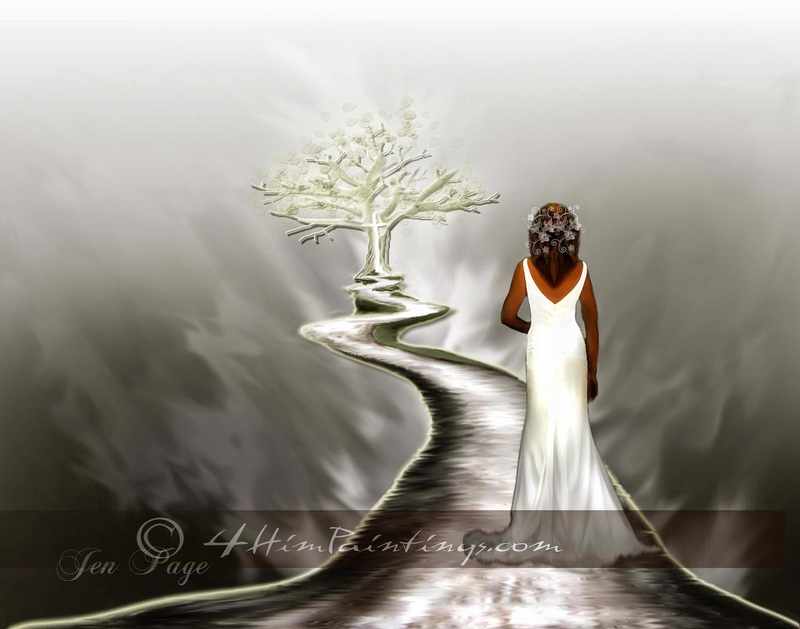 You must understand that while we are justified before God the process doesn’t end there. It can be just as bad to rest in your justification and not pursue the process of sanctification (becoming holy), as it is to simply avoid evil things. James speaks of this in the following verses, 2:17, 24, 26, “In the same way, faith by itself, if it is not accompanied by action, is dead. You see that a person is justified by what he does and not by faith alone. As the body without the spirit is dead, so faith without deeds is dead.” Seeking holiness requires some action on your part. While this includes avoiding evil, it is not limited to it. Seeking holiness means letting God possess your total life, not just certain outward actions. While God performs the work of sanctification, (Hebrews 13:20 21 says, “May the God of peace, who through the blood of the eternal covenant brought back from the dead our Lord Jesus, equip you with everything good for doing His will, and may He work in us what is pleasing to him, through Jesus Christ.”) we participate by seeking God with all our heart, soul and mind. Jesus referred to this in Matthew 22:37 38 when He said, “Love the Lord your God with all your heart and with all your soul and with all your mind. This is the first and greatest commandment.” So you see it is a joint venture. God supplies us with the means to accomplish sanctification, but we must choose to obey Him and love Him. It is a delicate balance, the Christian life. We are called to pursue holiness, which requires effort on our part to seek God and to obey His word, yet; we cannot do it in our own strength, we must rely on Him completely. What a path to take! Not just avoiding evil, but pursuing the most holy God who saved us from our sins, from ourselves, from evil and death. Are you avoiding evil or are you pursuing holiness? Are You Avoiding Evil, or Pursuing Holiness? Well, while it is true we are to avoid evil things as Christians, I think we are not always pursuing holiness when we do. Many people, both Christians and non Christians often try to avoid evil. Most people with common sense and some moral fiber consider it wise to stay out of the way of evil. It doesn’t require a commitment to our Lord to simply step out of evil’s way. Many people who consider themselves good upstanding citizens would tell you they try to avoid the evil path. I would suggest however, that you can avoid evil in your life, without seeking and pursuing holiness. Jesus referred to this situation when he discussed the spiritual lives of the Pharisees in Matthew 23:25 26 saying, “Woe to you, teachers of the law and Pharisees, you hypocrites! You clean the outside of the cup and dish, but inside they are full of greed and self indulgence. Blind Pharisee! First clean the inside of the cup and dish, and then the outside also will be clean.” He stated that while your actions of avoiding evil may appear to be honorable, if your internal condition is unholy you will never see God. Hebrews 12:14 says, “Without holiness no one will see the Lord.” The Pharisees had the appearance of holiness due to actions, but inwardly were far from it. Pursuing holiness is more than avoiding evil. It is seeking to be Christ like and filled with God’s Holy Spirit. Pursuing holiness is letting God’s Holy Spirit have His way with your heart. Avoiding evil outwardly does not always reflect your heart condition. You can avoid evil and still hold onto your self will. However when you strive to be holy, you sacrifice your will and replace it with God’s will. Avoiding evil is simply crisis management. You don’t have to think about God unless something evil presents itself. You can jump from evil temptation to evil temptation attempting to avoid each of them without ever thinking of God in between. 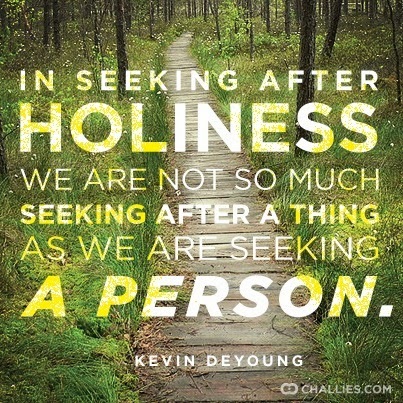 Pursuing holiness is another matter. It is CONSTANTLY, MOMENT-BY-MOMENT seeking God’s presence in your life. Evil will present itself to you at times while you are pursuing holiness. But since you have already sought out your Savior before evil ever came into view, what do you think are the results of such a holy life? Yes, the ability to avoid evil is probably a much easier decision when you have been consistently pursuing holiness. They say that the best training a person can receive for detecting counterfeit money is to handle the real thing. If a counterfeit Jesus or evil temptation comes your way, do you struggle at examining it, evaluating it, testing it, seeking to determine if it is really evil or not? I would submit to you, that if someone is consistently pursuing holiness, they don’t have to think twice about whether something is evil or not. Coming soon! New teachings dedicated to building up and strengthening the beloved bride of Christ. Keep checking in, you will be blessed.